Glick Miller Musings: Baseball is coming! Today is opening day for most teams. It's exciting. Means summer is right around the corner. 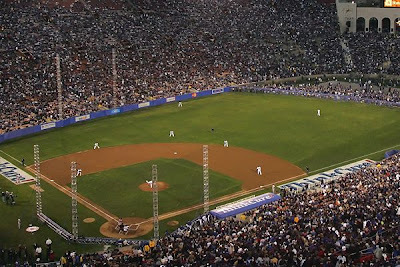 In case you missed it though, the Red Sox and the Dodgers played an exhibition game at the Coliseum and 115,300 people watched the game--most ever to watch a baseball game. For comparison, Jacobs field seats around 43,000. The Coliseum obviously isn't designed for baseball right now. The left field foul pole was 201 feet from home. It's hard to see in the photo, but the 60' net at the wall didn't seem to keep many balls in the park. The right field fence was well over 400'.